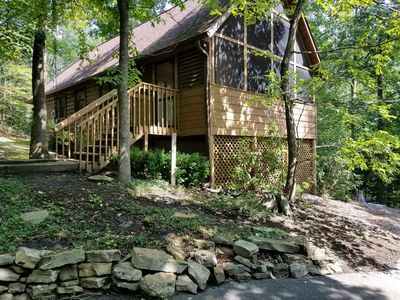 Our deluxe three-floor cabin has all the amenities needed to make any trip to the beautiful Smoky Mountains a dream vacation. 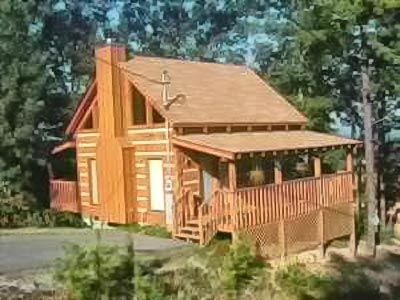 Furnished to make your stay comfortable, the cabin features a fully-stocked kitchen & sleeping accommodations for 8-9 people. 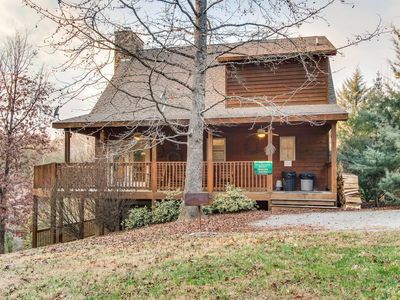 Ample parking available outside both cabin entrances. 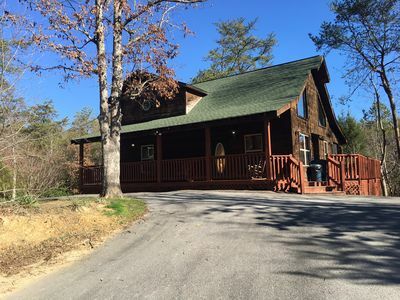 The cabin is located in the Big Bear Lodge & Resort and is easily accessible from Wears Valley Road....with no steep or winding roads to drive! 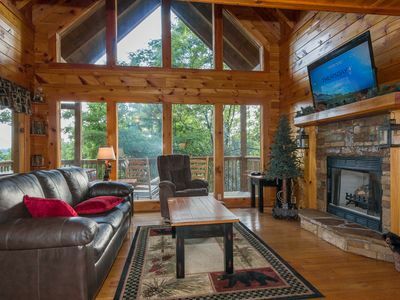 Stay in and relax or visit the many exciting attractions in Pigeon Forge and Gatlinburg. 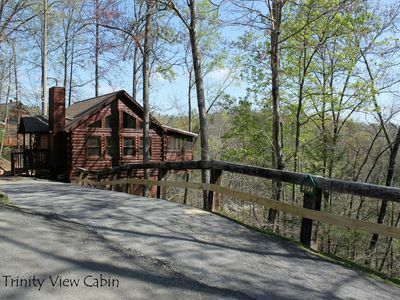 Our cabin is located right off the Parkway at Light #3/Wears Valley Road. 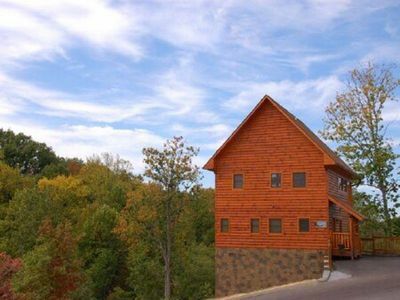 It is part of the Big Bear Lodge & Resort on Valley Heights Drive. 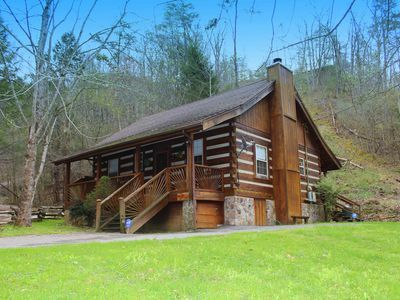 Our cabin is a half mile off the Parkway, 4.5 miles to Dollywood & 15-20 minutes from Gatlinburg! 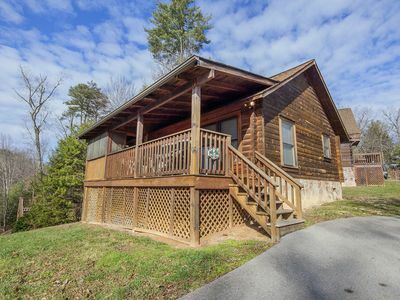 NEAT FACT: This cabin is part of a duplex. If you have a large party, there is the possibility of renting both sides and opening the connecting door on the main floor for even more togetherness! The other side sleeps up to 5 people. 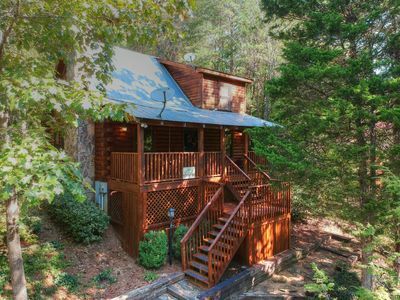 See our other cabin at vrbo.com/1142343. 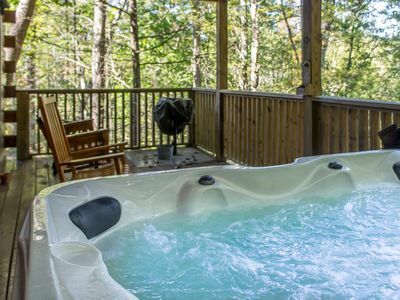 Relax in the hot tub on your very own private screened-in porch, swim in the outdoor pool in warm weather, or enjoy the indoor pool, game room or fitness room located in bottom level of the condo building on resort. There's always something to do to keep the family entertained...including Wi-Fi service throughout the cabin!! 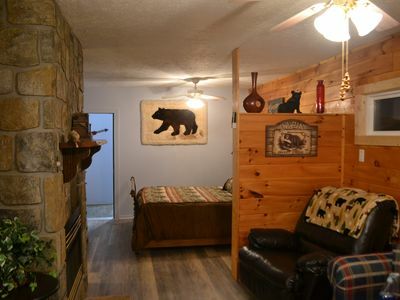 The main floor has a livingroom with gas fireplace and a queen size pull out sofa. The livingroom also has a flat screen HD SmartTV that is Netflix enabled. The TV is set up with the owner's Netflix account so that guests may pick from their Netflix queue for your viewing entertainment! 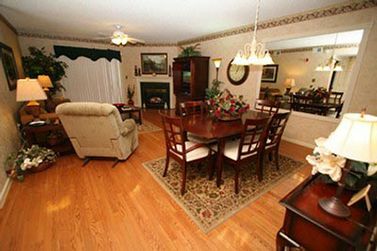 Also on the main floor are the dining area, full kitchen, washer/dryer, a full bath and a screened in porch with hot tub. A roomy dining area is located off the livingroom on the main floor and leads to kitchen. From the kitchen, a french door leads to the screened in porch. 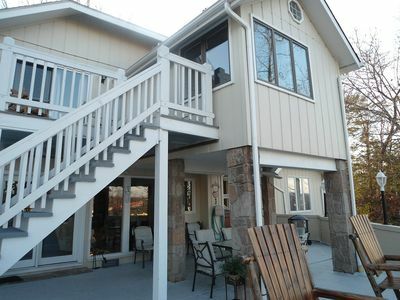 The screened-in porch features a seating area and hot tub and is a great place to hang out with family and friends. A full bath and stackable laundry unit can also be found on the main floor adjacent to the kitchen. The top floor features a master suite with beautiful views from the balcony. 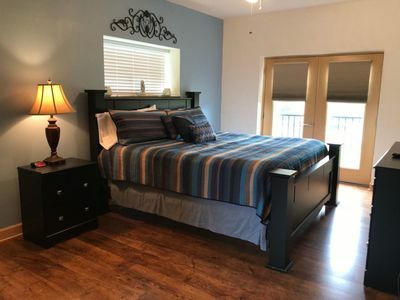 The bedroom has a king-sized bed, en suite master bath with walk-in shower, and a flat screen HD SmartTV. Located outside the bedroom is a loft area with a comfy twin daybed that overlooks the living room. The loft is a great place to curl up with a book....some are even provided on the shelf in the loft! 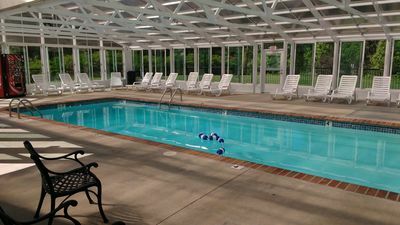 The outdoor pool is located right outside the bottom floor entrance. Indoor pool, workout room and game room located in separate building right across from the main floor entrance! 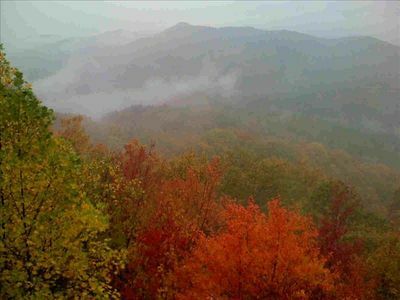 'A Beautiful View with unlimited High Speed Internet! Amazing VIEW! 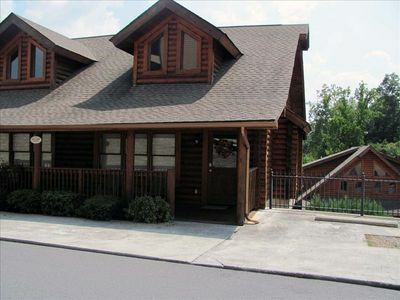 Mountain Views-Hot tub-Free Wifi-Loft King Bed-Pool Table-Big TV for Game Day! ER82 - The Wolves Den - Great location...close to all the action! 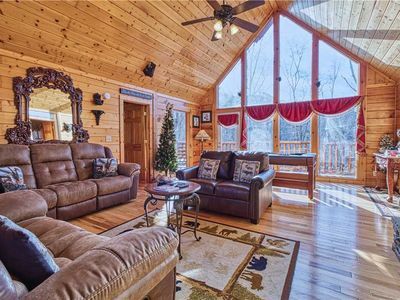 "Lucky Charm" is a cozy, 3 level log cabin situated on 3 acres. 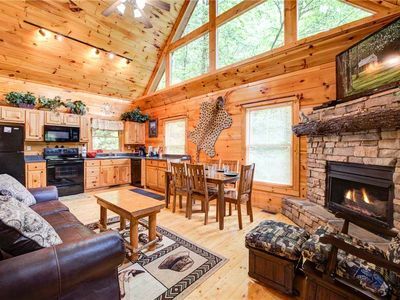 "Bear End" is a cozy cabin nestled in a wooded, private setting with all of the amenities of home. 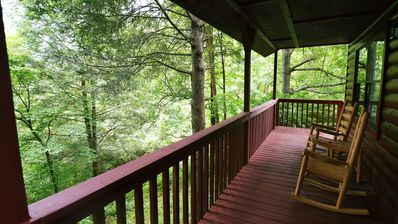 NEW 2 Bedroom Romantic Hideaway - Pet Friendly - Minutes from Everything!